The "D&M" single was "On The Shelf", a disco track from 1978. This is almost a piece of trash and the dog a bone words compare to a children’s song about a dog and bone and a man rolling home. which has been my play-for-the-day cd. Then, the more I listened to the two songs, the more I compared them. one is late 1973, the other early 1975. As I have said previously, the vocals on both are incredible. Subjectively, I add, the arrangement for Solitaire impresses me more than This Masquerade. Now, if only the flute solo were replaced with a 'heavier' instrument in This Masquerade ! I love them both, it's simply that Solitaire moves me more emotionally. I wouldn't really call 'This Masquerade' a ballad - or if it is, it's certainly not a ballad in the vein of 'Solitaire'. It's got too strong a jazz feel to really fall into that category. I guess it's horses for courses - I'd say 'This Masquerade' is one of their very best arrangements, whereas that on 'Solitaire' is totally pedestrian in comparison. The flute solo provides a perfect break in the track and creates the space to hear those lovely background harmonies. It’s interesting that their version of This Masquerade comes in at almost five minutes but George Benson managed to do it in 3:17. I think the flute piano duet is quite lovely and it reminds me of baroque and pre-classical period styled music but placed on jazz instead. I think it’s a rather ingenious take with the deep chord progressions that counter the simple melody. This Masquerade is a deep technical moving song. Solitaire is beautiful for Karen’s text painting with her vocal technique. It’s interpretation is exquisite. The single version orchestration is parallel to the singer’s conquest of mood and solitude. They are both artistically balanced yet entirely different. Yet, they both give chills to the listener. I guess a few more minutes more of vocalizations (skat) would have wore out the listener. The flute solo provides a perfect break in the track and creates the space to hear those lovely background harmonies. I’d love to hear those backing harmonies in isolation. Quintessential Carpenters. After “Solitaire” did not do that well, you have to wonder who thought “I Believe You” was a good choice as an A-side single. “Slow Dance”, “Dancing In The Streets” or maybe even “Honolulu City Lights” should been released in 78. Much edited. The album version is much longer. The vocals on 'Solitaire' are exquisite and so is the arrangement. 'This Masquerade' has a more sparce arrangement than 'Solitaire' but, once again, the vocals and arrangement are close to perfect. 'This Masquerade' does have slight jazz influences, but its jazz colourings are very light. It's definitely more pop. 'I Believe You' was a Top 30 pop and Top 5 R&B hit for Dorothy Moore not much more than a year before Carpenters released it, so from that point of view, it probably wasn't the best choice as a single for Carpenters at that time. It was probably unlikely that their record would receive much radio support, seeing as stations had obviously been playing Dorothy Moore's version not very long before. 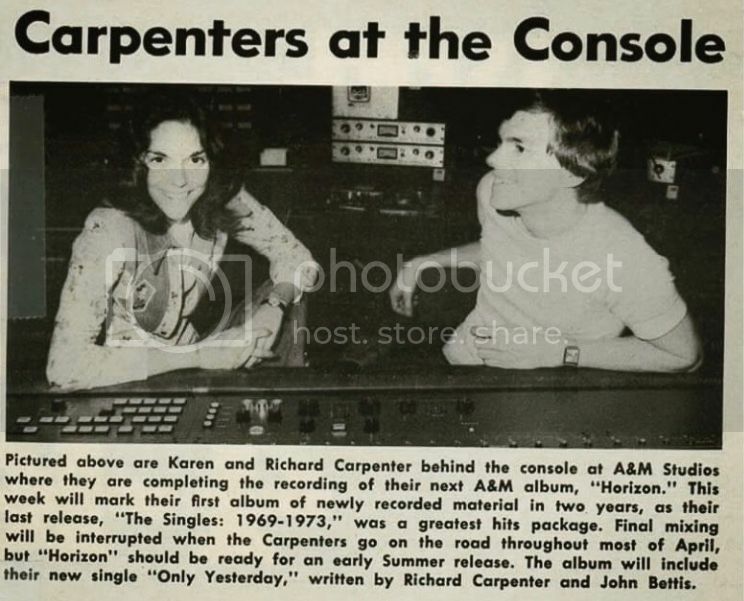 And it seems that radio, indeed, did avoid Carpenters' version. Also, although there was still a strong presence of ballads and lighter material on the Top 40, the song was probably out of step in late 1978 with what was popular. Dorothy Moore's version, although it has a fantastic, soulful lead vocal, has an arrangement that is more in keeping with pop than soul, incidentally. I have thought that, in Carpenters' case, the song was an attempt to link with the wedding / marriage thing, which had worked with 'We've Only Just Begun' and 'The Wedding Song, (There is Love)', (for other artists), but failed in this case. However, I think that Carpenters' version of 'I Believe You', once again, features brilliant vocals and an ear-catching, (if, perhaps, over-embellished) arrangement. I certainly sat up and listened to 'I Believe You' every time it came on the radio when it was first released, (it was played every afternoon for a while on my local radio station), and thought it was exciting, exhilarating listening and beautifully performed. Personally, I think that 'This Masquerade', 'Solitaire' and 'I Believe You' are all brilliant and in another time and place with better support and different circumstances, could all have been smashes. CarpentersToYou and Jamesj75 like this. No flute solo....these are the parts of the arrangement which I love. How is this arrangement not anything but heart-wrenching ? You like the oboe. To me, it always screamed elevator. I know Richard held that out as being unique and it was...for good reason. To my ears, it cheesed out all it touched and instantly made the tune sound older than it is. That's why no one else was using it on Pop records. I'm listening to it again right now and I totally hear why you like it. Her vocal is just stunning - even though it's clear to me it's not really her thing. She went in for all she was worth. It also builds really well. I just plods for me and doesn't go anywhere interesting from a chordal perspective. "This Masquerade", for me, is just a far more interesting song. The lyrics are little clunky at times but the melody they convey is fantastic and the chord changes are perfection. The flute solos are as close to jazz fusion as Carpenters ever got. I absolutely love that. We also can't forget Richard's amazing piano solo. I won't even go into that incredible vocal arrangement or Karen's incredible vocal. Between the two tunes, I find this to be the most interesting vocal. Better yet, he avoided the oboe... LOL!! CraigGA, Rumbahbah and GaryAlan like this. I love Richard's use of oboe on Carpenters recordings. It's one sound that is distinctly 'Carpenters' for me. I've never noticed that it jars on 'Solitaire' but I guess, since falling under the spell of the song and performance when I was a pre-teen and it was a hit on the radio, I've never thought to question my opinion. I still think the recording is perfect. The original lyrics on 'Solitaire', as recorded by other artists, were certainly clunky in places and Richard or Karen were wise to change them, leave sections out or to request sections to be re-written....whatever it was.....as they did on 'Trying to Get the Feeling', 'Make Believe It's your First Time', (the added bridge), and 'You're the One', (etc). Richard: "I heard Solitaire on a Neil Sedaka album. It caught my ear and then I forgot about it. Then Andy Williams had a hit with it in England, and then, of course, I remembered it again. We did it on the Horizon album. It's not one of Karen's favorites, but she sings the hell out of it." Karen: It was a good record but never did....For some strange reason he loves it. I liked it too, but somehow it drags for me. I don't know." Ugh, the dreaded oboe. It is almost something of a trademark for them, but I really wish it wasn't. In the right circumstances, it had its place, but it was heavily over-used on their songs and nearly always made the songs sound less current and more old-fashioned, to the song's detriment. ^^Interesting. Rumbahbah and Ed have me to thinking. Compile a list of songs which combines both in the arrangement (are there any ?). Karen is dead on, IMHO. Richard isn't wrong either. She does sing it incredibly well. John Adam, goodjeans, GaryAlan and 1 other person like this. ^^The late March 1975 A&M Compendium Interview includes the photo above. "Final mixing will be interrupted...."
provides clue as for why the album release date being Summer. But, I wonder, was the album originally intended to be completed and released earlier than Summer ? I'll do some digging into the Fan Club Newsletters. Just wanted to say...Having not seen this thread for awhile, I started reading the other night and was amazed at the flurry of activity from Aug 19th to the 27th. On Aug 19th alone, I count 16 posts. And I will also add, very good posts indeed. I couldn't stop reading! I love "Horizon"! For me, it was the last great album the Carpenters put out. In my opinion, 1975 was the end their best, outside of the released singles "Sweet, Sweet Smile" and "Those Good Old Dreams". does sound awesome in clarity. are exceptionally crisp and evident. I agree that it sounds superb, however it's an exact sonic clone of the original A&M Compact Disc from the 80s. Clocking in at just over 30 minutes you'd think you were buying a punk record! As much as a love this album, I always felt cheated. But then it has a beautiful cover shot and I could stare at it for hours. It doesn't contain a lot of music, but the songs are beautiful, sound great, has one of the best singles of the 70's for pop radio, Only Yesterday. Had their last #1 hit in the USA, Postman. Contains the big lush ballad, Solitaire. Still wish it had bonus tracks, but seriously, even the bookend songs are beautiful. So it's time to stop whining and get "Happy!"